The potential impact of volcanic overprinting of the Eddy Minimum | Watts Up With That? Hence the surface was early frozen. Hence the first snows remained on it unmelted, and received continual additions. Hence the air was more chilled, and the winds more severely cold. Hence perhaps the winter of 1783-84 was more severe, than any that had happened for many years. Benjamin Franklin was referring to the Laki eruption in Iceland of 1783. This was accompanied by an abnormally hot summer in Europe and then an exceptionally cold winter in Europe, the United States and Japan. In the United States, Charleston Harbour froze and the Mississippi River froze at New Orleans between 13th and 19th February, 1784. When this logjam of ice broke up, ships encountered ice flows in the Gulf of Mexico 100 km south of the delta. The famine in Iceland caused by the Laki eruption killed 24 percent of the population. In the second half of the Modern Warm Period, when solar activity was at its highest for 8,000 years, there was one volcanic eruption large enough to affect climate. This was the eruption of Mt Pinatubo in the Philippines starting on 15th June, 1991. It ejected 10 cubic kilometres of magma and 20 million tonnes of sulphur dioxide. The aerosols it injected into the stratosphere lowered the global temperature by 0.5°C in 1992, with a peak effect of 0.7°C. The impact on agriculture though was not significant. Some wheat farmers in the northern part of the Canadian wheat belt found that the cool growing conditions didn’t allow their crops to mature in time before winter set in. They resorted to using Roundup to make hay from their standing wheat crops. The impact on climate and agriculture of the Mount Tambora eruption on the North-eastern United States is reasonably well documented. The current great grain producing area of the United States is 1,100 kilometres to the west. Nevertheless, what happened in the north-eastern states two hundred years ago is a good proxy for how the Corn Belt will respond to a major volcanic eruption during a climatic cool period. Visitors to the mid-western states in that period noted mid-summer frosts up to the mid-19th Century. “The year began, at least in Phillipstown, Massachusetts, with enough snow on the ground for sleighing. All over New England, January was a snowy, stormy month until the very end when a sudden thaw caused localised flooding such as the one reported by Isaiah Thomas at Worcester, Massachusetts on 23rd January where some mill dams were carried off and some items stored in a warehouse were destroyed. According to among others, Leonard Hill of East Bridgewater, Massachusetts, February was a mild and pleasant month with only three snows reported. By the beginning of March there was little deep snow anywhere with the exception of most of northern New England. Early March was clear and cold, and was followed by a series of three snow storms around mid-month that produced a few days of sleighing but soon melted. On 28th and 30th March, warm air returned producing thunder and lightning as reported by Elijah Kellogg at Portland, Maine and Thomas at Worcester. April quickly turned cold again with frequent frosts and some snow. However, by 14th April, there was little snow left at Hallowell, Maine. By 19th April, Alexander Miller of Wallingford, Vermont had begun to plough his fields; Stephen Longfellow of Gorham, Maine was already planting wheat; and Theodore Lincoln of Dennysville (in far down-east Maine) was reporting ice-out on the local streams – a sure sign of coming spring. At the end of the month, Joshua Lane of Sanbornton, New Hampshire already was reporting the start of a drought that would later plague all of northern New England. June is the month most remembered for its outbreak of cold weather. On 4th June, there were frosts at Wallingford, Vermont and Norfolk, Connecticut. By 5th June, the cold front was reported over most of northern New England. On 6th June, snow was reported at Albany, New York and Dennysville, Maine, and there were killing frosts at Fairfield, Connecticut. 7th June brought reports of severe killing frosts from across the region, and as far south as Trenton, New Jersey. Typical of comments by diarists concerning this day are those by George W. Featherstonehaugh of Albany, New York, who wrote that the frost killed most of the fruit, as many apple trees were then just finishing blossoming. Leaves on most of the trees were “blasted” by the cold. Corn and vegetable crops were injured. He also feared that many of the sheep that had just been sheared might die of cold. Cold weather continued through the night of 10th June. By the end of the month most observers were reporting the return of warm weather, but by then most crops were either killed or “backward” and stunted in their growth. In northern New England, those crops that survived the frosts were hit by what was now a very serious drought, greatly reducing the production of one of the area’s primary crops, hay. In early July there was another outbreak of cold weather in northern New England. On 5th July, at Gorham, Maine, there was a very hard frost. Benjamin Kimball of Concord, New Hampshire and Thomas Robbins of Norfolk, Connecticut reported hard frost on 7th July. There was frost on 8th July at Portland, Maine and on the following day at Sanbornton, New Hampshire. Thereafter the cold held off for the remainder of the month. Dry conditions, generally reported earlier in northern areas, persisted throughout the entire month. Frosts returned on the morning of 21st August, being reported at York and Portland, Maine and Wallingford, Vermont. By 22nd August hard frosts were noted all over the region and as far south as Trenton where buckwheat crops were killed. Thomas, at Worcester, Massachusetts, reported that these frosts “cut off Indian corn in many places”, while others such as Hill at East Bridgewater, Massachusetts observed that frosts did little or no damage. The frosts continued into September. In northern New England there were frosts on 10th and 11th September and throughout New England during 25th to 27th September. On 28th September, there was a killing frost throughout the region extending as far south as Trenton. It killed any vegetation that had somehow survived to that date. The drought in northern New England was finally broken by rains in the last week of the month. 1816 had an extremely short growing season. In southern Maine, it had averaged 140 days up until then but plunged to 70 days in 1816. Consequently farmers experienced an almost total failure of major crops. There was a fair yield of winter grain, but other crops such as corn and hay failed leading to the loss of many sheep and cattle for lack of feed during the following winter. As a result, 1816 has come down to as the “cold year”, “the famine year” and ‘eighteen hundred and froze to death”. For eastern Massachusetts, 1816 is the only year in which young corn was killed in the spring after it had sprouted and in which corn that survived replanting was killed in the autumn, before it could reach maturity. Under these circumstances, it is safe to assume that in most places in New England corn crops were an almost total failure. The story for 1816 is the same for New Hampshire and Maine. There were a number of periods in which corn crops were hit by late spring or early autumn frosts. Particularly difficult periods include: 1793-96, 1812-17, and 1835-36. The effect of the Mount Tambora eruption is also well documented in Europe. From 1813 to 1815, harvests were generally lower than expected. However, 1816 was a year of calamity for most of the continent. Spring saw heavy rains which were followed by snow in June and July that caused widespread harvest failures. Wheat yields in France, England and Ireland were at least 75 percent lower than at the beginning of that decade. Wholesale wheat and rye prices responded by roughly doubling in 1817 across the continent. The area affected the most was southern Germany where prices increased by three hundred percent by the period May to June of 1817. In Germany and Switzerland, people resorted to eating rats, cats, grass and straw as well as their own horses and watchdogs. This was the last great subsistence crisis of western civilisation. With a solar activity now falling away and return to cold climate conditions imminent, it would be a useful exercise to calculate what would happen to American crop yields using the year-by-year climate conditions of the first half of the 19th Century. This would give an indication of the size of the problem. It could be that grain production might fall 60 percent from what it is now in the event of a major volcanic eruption during the Eddy Minimum. No American need starve if they were happy to live on a diet that was mostly corn and soybeans. The price of meat would skyrocket and a large portion of the national herd of lot-fed cattle and pigs would be slaughtered to avoid the cost of feeding them. Grain production in Canada in an 1816-type year would be wiped out completely. An indication of what would happen to food pricing and availability is the price response of oats in the north-eastern United States in 1816, which rose from 12 cents a bushel to 92 cents a bushel. A repeat of the climate experience of 1816 in the world’s temperate region grain belts would most likely result in almost all of the grain exporting countries ceasing exports in order to conserve grain for domestic consumption. The effect on countries currently importing grain would go beyond calamity to catastrophe. The resultant mass starvation event would become the largest event in human history. Current grain stocks carried by countries around the world assume that tomorrow will be much the same as today. As at year-end 2012, total world grain stocks were estimated to have been 328 million tonnes, which equates to 21% of annual demand. The days of the continuous benign climate of the second half of the 20th Century, due to the highest solar activity for the last 8,000 years, are now past. Perhaps continuing cooling over the rest of this decade will suggest to some that it would be prudent to plan on the basis that the climate for grain growing will continue to get worse, before there is another major volcanic eruption. Absence of planning could be considered as a suicidal tendency. Major volcanic eruptions occur about every 45 years on average. At the present, in the year 2013, with the oceans warmer than they have been for 800 years, the chance of a Mount Tambora-like eruption causing another mass famine is very slight. The world will be much cooler by 2020 though, and with an average period between eruptions of 45 years the chance of any individual year witnessing a mass famine event after 2020 will be about two percent. The cumulative chance rises to near 40 percent for the period 2020 to 2040. The world may dodge that bullet. Or it may not. Cold-driven reductions in grain supply will be quite distressing even to those who are fully prepared. The unprepared will become quite dead. ← Does NOAA’s National Climatic Data Center (NCDC) keep two separate sets of climate books for the USA? The Next Grand Minimum is to be the Eddy Minimum. Please read the whole post by David Archibald, as he raise some interesting question about what our future might hold, based on what has gone on before. History has a nasty habit of repeating it self, we live in world of cycles. ENSO meter has swung negative. There is no good evidence for that. On the contrary, the recent solar activity has not been exceptional. Don;t hold your breath for the Met office to plan for this. I liked your comment though that storage of grain amounts to 21% of annual demand. If there was a meteorite or supervolcano this would be a signficant stat. Hard to plan for it though. Any link solar activity and plate tecnotonic activity? Or said in an other way Can a factor in our Sun system affect both sun activity and earthquake and volcano activity at the same time? Interesting speculation. I do not discount the records of the past either. I do suggest that duplicating those conditions is very unlikely. I’m not all that sure about this Eddy Minimum business either. First is just started. I would think a bit premature in naming it too. Yes, solar activity is way down on a rather relative scale. What that means on a global or regional basis has yet to be determined. The models for predicting are as good as the AGW ones. How deep or long this diminishment of solar activity is, remains to be seen. We simply are in no position to accurately predict it. And even if we were we are in no position to model the results correctly. What we should have learned from 1816 was to keep a reasonably good supply of grain in storage from year to year. The folk wisdom to do so results from collective experience which we ignore with risk. It seems to me as a society we must keep asking ourselves how we got to where we are. Humanity seems to learn nothing from history as we keep repeating the same mistakes over and over. Science and address many of questions. Some, those dealing with a priori inductive logic or belief systems are beyond its scope. But we probably have been at probably the longest sustained strong solar period without a grand minimum since the Medieval Maximum. I believe that would be a fair statement. It was 110 years from the end of the Wolf to the start of the Spörer. 95 years from the end of Spörer to the start of the Maunder. 75 years from the end of the Maunder to the start of the Dalton. It has been almost 200 years since the end of the Dalton. It was about 230 years between the end of the Oort minimum, through the Medieval Maximum to the start of the Wolf Minimum. The two strongest components of the ~11 year solar cycle are 11.05 and 10.49 years which give 207 years beats while other components of 10.01 and 11.79 years also create beats of near to 104 years. Got a link for that? I didn’t know this had been finally decided by the astrophysics community. I still think it should be called the ‘Ad Ho Minimum’. Shadia Habbal, the Solar Physics Division chair, has taken up the task to consider this. The current status is that since it is not certain that we will have a Grand Minimum perhaps it is premature to name anything, but should a Grand Minimum occur, the Eddy Minimum is a clear favorite. The solar community is not keen on naming things after pseudo-scientists or modern astrologers, but since Eddy was neither, he is a favorite candidate. Clearly David your no farmer. Why a farmer in the northern Canadian wheatbelt (locally they call it the prairies) would waste money on Roundup to turn a standing failed wheat crop into hay instead of just cutting it down with a swather, or windrower and then bale it for greenfeed is beyond me. Can a factor in our Sun system affect both sun activity and earthquake and volcano activity at the same time? There are plenty of papers in the literature purporting to demonstrate a link between low sunspot numbers and volcanoes and earthquakes. There are no simple one to one relationships, but taken over longer timescales, there is a pretty obvious correlation. There are plenty of papers in the literature purporting to demonstrate a link between low sunspot numbers and volcanoes and earthquakes. There are plenty of papers about almost anything. When you look more closely, the claims fade away. Now, there is some evidence that the cosmic ray record is contaminated by volcanic activity, either directly or via climate, so some of the so-called Grand Minima could be of volcanic/climate origin and not solar at all. This is, of course, speculation, but so are the purported links. You shouldn’t uncritically believe everything you find on the internet. It bears noting that the consensus view is that the Year Without a Summer was only mildly cooler than normal, maybe a blip of 0.2 degrees Celsius on the consensus hockey stick graph. Climate influences other than carbon dioxide are not fashionable right now. This thread refers to historical evidence that I have been aware of for many years. It contains part of the data that led me to consider that climate changes are primarily caused by expansion and contraction of the polar air masses as a result of waxing and waning solar influences operating via the intensity of the polar vortices. The drought and cold of 1816 and the years before and after fit well with more equatoward climate zones and jet stream tracks than we see today and probably with greater jet stream meridionality than we became used to during the recent late 20th century warming. I noticed similar reports in the diaries of Samuel Pepys and other reports from the period around the Maunder. Also ships logs about depression tracks in the LIA. In contrast the MWP was a benign period with poleward storm tracks which allowed relative prosperity to develop in the outer islands to the west of Scotland with relatively uneventful inter island transport. I think our regular contributor tonyb has compiled a lot of information of a historical nature which all tells a similar story as regards climate and weather shifts observed when solar activity changed for decades at a time. It is only those with a relatively sparse historical knowledge who still entertain the notion that a link between the sun and global air circulation is ‘unlikely’. Curious as to what the effect might have been in Southeast Asia region of the world. Thailand and Vietnam a few years ago suffered rice crop failures due to cold, which caused governments in the region to restrict rice exports. Vietnam is again experiencing freezing weather in the mountains. Given that regions heavy dependence on a warm weather crop, I wonder if the savage effects of an 1816 like event would be far more devastating there than here in the continental USA? (AKA gravity waves when passing through matter) from our galactic core. The extent of our galaxy is limited to the “range” of these waves. All of our major climate cycles — Eg ; H/DO & Bond cycles, are a products of our galactic core. Note the three “wraps” in the 100,000 year time span is our 33,000 year climate cycle that our shorter cycles follow. See any legitimate temperature graph covering the last few glacial cycles. We are presently in the midst of a cold period which occurs every 150,000,000 years. “recent and ongoing” rapid tectonic movements of earth’s crust. of cold encountered but we don’t have the optimums. Its time to rethink the food->biofool issue. What a waste that is ! We all know that raise CO2 is great, especially with a extra warmth as well, but does raised CO2 levels help that much if it gets cold ?? I haven’t seen much info about that facet of CO2 / plant interaction. So you promoting Eddy and Anthony publishing David Archibald’s untrue statement is an astroturfing exercise. OK. The solar community is not keen on naming things after pseudo-scientists or modern astrologers, but since Eddy was neither, he is a favorite candidate. As well as successfully pedicting the present solar minimum (while ‘the solar community cnsensus’ said solar cycle 24 would be the highest evah), Theodor L published quite a few papers cited by many other scientists in ‘the community’ and your attempts to blacken his memory are shameful and disgusting. Just like your other attacks on other scientists like Ilya Usoskin, Abreu et al and Nicola Scafetta. Well said tallbloke. A true injustice going on here. @redneck to answer your question about Roundup usage – I remember that farmers who used it gained ~2 weeks on the ripening of their grain. Giving them a tremendous advantage over non-users. Interesting speculation. I do not discount the records of the past either. I do suggest that duplicating those conditions is very unlikely. I’m not all that sure about this Eddy Minimum business either. First is just started. I would think a bit premature in naming it too…. The naming is because there is a group who had been calling it L***t Minimum after the guy who predicted it, *Land*sch*eidt*. (Using his name here gets an automatic boot into the ether) However his name is mud in solar physics circles where he is considered a wacked-out kook. Hence the rush to name the possible modern Minimum the Eddy Minimum before the other name become stuck fast through common usage. And BTW the astrologer’s prediction of solar activity was wrong as he predicted the very low minimum to occur in 1990. But, who really cares about failed predictions? And BTW the astrologer’s prediction of solar activity was wrong as he predicted the very low minimum to occur in 1990. As an interested bystander. enlighten me, isn’t 1990 a better prediction than NASA/Hathaway managed just a few years ago? The difference is that Hathaway [his predictions are not NASA’s] has acknowledged that he was wrong, while the current troop of L-enthusiasts has not. Any particular reason for the flagrant use of ad hominem? You are missing a significant current policy that David did not point out in his essay. You need to understand the background political maneuvering to understand just how dangerous the current situation actually is and how it is going to get a lot more dangerous going forward. So please take the time to read this. To blunt the ravages of drought and market greed, we need a national grain reserve….our country cannot even threaten to bolster the national supply because the United States does not possess a national grain reserve. Such was not always the case…. 1. Four privately held corporations, Cargill, Louis Dreyfus, Andre, and Bunge., control 90% of the world grain market. These corporations are owned by seven families. 2. The World Trade Organization Agreement on Agriculture was written by Dan Amstutz, VP of Cargill and later partner in Goldman Sachs. One of the most influential in creating the WTO is a little-publicized organization called the IPC– the International Food and Agricultural Trade Policy Council, shortened to International Policy Council. The IPC was created in 1987 to lobby for the GATT agriculture rules of WTO at the Uruguay GATT talks. The IPC demanded removal of ‘high tariff’ barriers in developing countries, remaining silent on the massive government subsidy to agribusiness in the USA. A look at the IPC membership explains what interests it represents. The IPC Chairman is Robert Thompson, former Assistant Secretary US Department of Agriculture and former Presidential economic adviser. Also included in the IPC are Bernard Auxenfans, Chief Operating Officer, Monsanto Global Agricultural Company and Past Chairman of Monsanto Europe S.A.; Allen Andreas of ADM/Toepfer; Andrew Burke of Bunge (US); Dale Hathaway former USDA official and head IFPRI (US). Other IPC members include Heinz Imhof, chairman of Syngenta (CH); Rob Johnson of Cargill and USDA Agriculture Policy Advisory Council; Franz Fischler Former Commissioner for Agriculture, European Commission; Guy Legras (France) former EU Director General Agriculture; Donald Nelson of Kraft Foods (US); Joe O’Mara of USDA, Hiroshi Shiraiwa of Mitsui & Co Japan; Jim Starkey former Assistant US Trade Representative; Hans Joehr, Nestle’s head of agriculture; Jerry Steiner of Monsanto (US). Members Emeritus include Ann Veneman, former Bush Administration Secretary of Agriculture and former board member of Calgene, creator of the Flavr Savr genetically-modified tomato. The IPC is controlled by US-based agribusiness giants which benefit from the rules they drafted for WTO trade…. 3. The 1996 US farm bill, later dubbed Freedom to Fail (also written by Amstutz). Did two things. The USDA abandoned the policy of Strategic Grain Reserves and no longer bought surplus grain. US farmers were allowed for the first time since FDR to plant as many acres as they wished. They did and these two policy changes along with farm subsidies caused prices to plummet well below the cost of production even in third world countries. Many US farmers were bankrupted leading to the Freedom to Fail label. 4. Grain traders happily bought this supper cheap grain shipped it overseas and bankrupted third world farmers. At the same time WTO was ratified so was NAFTA. The number of farmers who have committed suicide in India between 1997 and 2007 now stands at a staggering 182,936…. These suicide data are official and tend to be huge underestimates…. For instance, women farmers are not normally accepted as farmers (by custom, land is almost never in their names). They do the bulk of work in agriculture – but are just “farmers’ wives.” This classification enables governments to exclude countless women farmer suicides…. The rate of farmers’ suicides has worsened particularly after 2001, by which time India was well down the WTO garden path in agriculture. Clinton who pushed the ratification of NAFTA and WTO even admits the goal was to wipe out third world farmers. …During testimony before a US Senate committee three weeks ago, Clinton admitted that requiring Haiti to lower its tariffs on rice imports made it impossible for Haitian farmers to compete. The trade policy forced farmers off the land and undercut Haiti’s ability to feed itself. So that is the first third of the mess. The second third is the WTO/UN push for strict regulation of farm world wide. As Sir Julian Rose put it. That ’game’ was all too familiar to me. Spend hours out of your working day filling in endless forms, filing maps and measuring every last inch of your fields, tracks and farmsteads; applying for ‘passports’ for your cattle and ear tags for your sheep and pigs; re-siting the slurry pit and putting stainless steel and washable tiles on the dairy walls; becoming versed in HASAP hygiene and sanitary rules and applying them where any food processing was to take place; and living under the threat of convictions and fines should one put a finger out of place or be late in supplying some official details…. …After clearing her throat and leaning slowly forward, the [EU]chair-lady said: “I don’t think you understand what EU policy is. Our objective is to ensure that farmers receive the same salary parity as white collar workers in the cities. The only way to achieve this is by restructuring and modernising old fashioned Polish farms to enable them to compete with other countries agricultural economies and the global market. To do this it will be necessary to shift around one million farmers off the land and encourage them to take city and service industry jobs to improve their economic position. The remaining farms will be made competitive with their counterparts in western Europe.”…. Not only do EU farmers live under this ridiculous time wasting bureaucracy and constant threat of fines but thanks to ‘Harmonization’ so do Australian, Canadian and in this coming year American farmers. Enter stage right the financial traders to take advantage of this new set-up. Remember Dan Amstutz who engineered this mess moved on to Goldman Sachs. when the global financial crisis sent investors running scared in early 2008, and as dollars, pounds, and euros evaded investor confidence, commodities — including food — seemed like the last, best place for hedge, pension, and sovereign wealth funds to park their cash…. In summary, we have record low grain inventories globally as we move into a new crop year. We have demand growing strongly. Which means that going forward even small crop failures are going to drive grain prices to record levels. As an investor, we continue to find these long term trends…very attractive…. There is only one problem. If Countries have grain reserves the commodities index game doesn’t make money and the Grain Traders do not make money. So the Grain traders wrote a letter. Recently there have been increased calls for the development of a U.S. or international grain reserve to provide priority access to food supplies for Humanitarian needs. The National Grain and Feed Association (NGFA) and the North American Export Grain Association (NAEGA) strongly advise against this concept.. Stock reserves have a documented depressing effect on prices… and resulted in less aggressive market bidding for the grains. Many of the countries that most need a national reserve are least able to afford one. The countries that can afford a reserve prefer to avoid the costs involved, relying instead on the private market. …………. It continues to prove very difficult to get some of the most influential members of the world’s richest economies—the G-20—to allow an open debate on reserves. Officials in different policy institutions, governments and agribusiness repeatedly confirm that the question is a political “non-starter” for many countries. …. So there you have it. The big transnational food companies and the bankers WANT food shortages and no grain reserves. They WANT food prices to sky rocket and they could give a rats rear end whether or not there were food riots in 30 countries and children starved. Unfortunately this leaves most of the world in deep doo doo if we have nasty weather over a lot of the world and crops fail. Clearly the issue to be confronted is not whether certain individual regions will have crops decimated (that’s a no-brainer), but whether there exists the capability for other, more southerly latitudes to take up the slack as a result. I’m no expert on the geography of the US, but my hunch would be that a scenario like this would see the ‘grain belt’ shift ten degrees south in the northern hemisphere and who knows what would happen in the Southern one. Could anyone forsee grain production in Europe shifting to Italy, Spain and Turkey? Tomato and citrus shifting primarily to North Africa and the Middle East?? Can you see sheep replacing cows in Germany and Northern France if temperatures drop?? They seem to survive pretty well in Scotland, on English mountains etc etc…..Fleece for warmth, lamb’s meat to eat, milk and cheese coming from goats instead of cows?? It’s possible……..
What would the climate in the Sahara look like?? Would it become a lush and fertile place and, if so, how long would it take to occur?? Would heated greenhouses become the norm in more northern latitudes as the open fields move southward?? After all, as long as the sun shines, you can grow fruit and vegetables inside a temperature-controlled building. It might not be the most perfect, luscious stuff, but who cares if it keeps you healthy?? As for America, one wonders what the future agricultural patterns would be in Oklahoma, Texas, Louisiana, Alabama, Georgia, Southern California, Tennessee, Arkansas and South Carolina would be?? I’m not enough of an expert to know how easy a transition would be, but unless it can be proved ex ante to be impossible, it’s surely a scenario worth thinking about professionally, isn’t it???? When the characterization fits it is hardly ad hom. ABSTRACT. Recent research has shown that cycles are at the core of creativity. They form antagonistic centers of polar tension, the competing realms of which generate fractal boundaries, sites of instability where new forms emerge. This knowledge, when applied to cycles and boundaries in the solar system, makes it possible to predict phases of instability, phase-shift, and emergence of new patterns in solar-terrestrial cycles. Perhaps this is your measure of sound science. It is not mine. re your comment at January 8, 2013 at 9:23 am. Whatever the language he used, the predictions by Theodor L. are clear, unambiguous and to date they are seen to have been remarkably correct. He was the first to predict the so-called ‘Eddy Minimum’. Therefore, it does seem reasonable to name what he predicted after him, and not to give that honour to Eddy or anybody else. Please note that the solar predictions of others – including you – have not shown anything like the accuracy of the predictions made by the late Theodor L. whose demise removed from him the ability to progressively alter predictions in the light of events (as you and your colleagues do; e.g. cycle 24). So, not only do rationality and justice suggest the so-called ‘Eddy Minimum’ should be named after its first predictor, the success of Theodor’s predictions suggest his strange methods should be evaluated and not dismissed. Those methods may seem to be bizarre but they are observed to have worked to date. It is prejudice – not science – to demean a person because you don’t like his methods when those methods are seen to have had predictive skill. (Of course, that apparent skill may be coincidental chance, but it is not science to assume the apparent skill is merely a result of ‘luck’). Landscheidt, T. Swinging sun, 79-year cycle, and climatic change. J. interdiscipl. Cycle Res. 12, 3-19, 1981. 1818 was cold in a cold time, as noted above. The Eddy Mininum, as it comes, will be cold in a warm time. The decline of temperature is not to a specific level, at least in the decadal sense, but a decline to a difference. The rise of temperatures globally from the early and mid-1800s to today has given us a higher initial start; a drop of, say, 0.5C globally will bring us back to the 1920s, not the 1820s. To see solar activity wrt sunspots and GCR as the determinant of global temperatures is to fall for the Unique Solution Syndrome underlying the IPCC. We are warm or cold as a result of a confluence of influences. Even if GCR or CO2 is a major player, it is not the only player of the climate team. Tambora, Laki etc. opertated their magic by increasing the albedo of the upper cloud component of the Earth so that the TOA TSI could not become SOE (Surface Of Earth) TSI. Whatever other temperature operating mechanisms, be they oceanic currents, PDO, AMO or CO2, will still be operating. If, as some of us suspect, the heat redistribution systems of Earth have a large portion in determining relative warming or cooling of the Earth, and that these systems are or have been operating to warm the planet since the 1850s, then the Eddy Minimum will be working to counteract these systems. But they will still exist. The threat of the Eddy to become a Dalton or a Maunder must be considered within the context in which we live and in which the Dalton and Maunder occurred. BTW, the use of Roundup to turn wheat into a feed crop for cattle would be bizarre. Roundup kills not just the plants today but those of tomorrow: it is a soil sterilizer. The loss of wheat in the 1992 Pinatubo year I well remember as the year my family in southern Saskatchewan snowmobiled over the swathed wheat to check its status. A very bad year. But no Roundup. When the predicted minimum did not occur, he progressively altered his ‘predictions’, e.g. Landscheidt, T. Extrema in sunspot cycle linked to Sun’s motion. – Solar Physics 189, 413 – 424, 1999. Never to forget that Galileo, a man much venerated in scientific circles, was a teacher of astrology for many years and rather famous for his astrological predictions that he claimed were absolutely certain. Also never to forget that Isaac Newton’s reply to (I think) Edmond Halley, who condemned astrology, was ‘Sir, I have studied it, you have not’. and the Winter of 1684, and all in even numbered cycles too. There is a good case that the major cause of the cold Summer of 1816 was solar conditions, not only by its placement in an even numbered cycle, but also by it being a close heliocentric planetary analogue (Ve,Ea,Ju,Sa) to the Spring of 1837. Are we today to take astrology seriously? Do you? it being a close heliocentric planetary analogue (Ve,Ea,Ju,Sa) to the Spring of 1837. That’s a synodic cycle of Earth, Mars and Mercury only, that can’t swing much. He would have been safer with 83yrs, at least that shows well in the Aurorae power spectrum. the predictions by Theodor L. are clear, unambiguous and to date they are seen to have been remarkably correct.. I didn’t, until I studied it. Given how mucked up the temperature records are here are two other measures of climate that could effect crops. NOAA fall (October) Snow cover for the Northern Hemisphere There seems to have been a switch in climate ~ 1995. Length of the Arctic Melt Season Again there has been a “Switch” to a shorter melt season for the last five years. We analyze the periods 1878–1944 and 1944–2008. The quasi-stationary wave in the North Atlantic region was stronger and the baroclinity steeper in 1878–1944 than in 1944–2008. The North Atlantic Oscillation Index—as defined by the Climate Research Unit, University of East Anglia—was higher in the former period too. We illustrate these statements by maps of sea level pressure and air temperature at the surface. The long-term trends in the North Atlantic Oscillation Index are linked to the trend in sunspot number such that when, in the mean, the sunspot numbers were high (Gleissberg maxima) the trends in the two quantities were parallel; and when the mean sunspot numbers were low (Gleissberg minima) the trends in the North Atlantic Oscillation Index and sunspots were opposite. We find the connections between the trends statistically significant, and we infer that the level of solar activity played a role in the trends of the past two centuries in the North Atlantic region. However, we cannot as yet provide a mechanism linking the solar trends to those in the atmosphere and ocean, but as a step toward an explanation, the equator to pole temperature gradient is steeper in a Gleissberg minimum than in a maximum. Is that what’s happening with the scientis proponents of CAGW? When I saw the comment that the current solar down cycle will officially be named the Eddy Minimum, I smiled. It made my day. Then reality; I go hunting for independent confirmation and find none. Very disappointing. As to all of the naysayers out there; Landscheidt proposed to name the current minimum after himself, all the while promulgating the notion that he understood how climate worked, based on solar cycles and making lavish predictions that haven’t really proven skillful as of yet. “Were God to give us, at last, the cable, or patch-cord that links the Sun to the Climate System it would have on the solar end a banana plug, and on the other, where it hooks into the Earth—in ways we don’t yet know—a Hydra-like tangle of multiple 24-pin parallel computer connectors. It is surely at this end of the problem where the greatest challenges lie.” – Jack Eddy. He knew we didn’t know. He spent his life trying to understand. He was a student of the natural world. And a scientist. Yeah, if anyone can provide positive confirmation . . . at least what actual academic body has made the proclamation, I would be very grateful. Jack Eddy was something of a hero of mine. This must be paper #2156 doing that. And indeed, I am not sorry to have this Opportunity of giving an example how to manage even Disputes with Civility; whence perhaps some Readers will be assisted to discern a Difference betwixt Bluntness of speech and Strength of reason, and find that a man may be a Champion for Truth, without being an Enemy to Civility; and may confute an Opinion without railing at Them that hold it; To whom he that desires to convince and not to provoke them, must make some amends by his Civility to their Persons, for his severity to their mistakes; and must say as little else as he can, to displease them, when he says that they are in an error. For those interested here is an Interview with Dr. Harry Van Loon who was one of the co-authors of the above paper link He is an interesting guy. Despite NASA’s top people (Dr. Hathaway & Dr. Dicpati) at the time said ‘we expect SC24 to be strongest ever’. Eruptions of El Chichon in the 1980s and Agung in the 1960s had effects on the climate comparable to that of Pinatubo. Looks bad to me, but even if it looked good, it is still not valid prediction. This is what it says in Wikipedia, but I can find no reference to Landsche*dt naming it after himself, especially in the wiki cited paper. Could you provide evidence of this claim? There you have it, all team IPCC has to do is “find” a volcanic eruption(1989-2009) and explain its effects were multiplied in the last decade by more fairy dust, and the models were right al along. If an enemy of the US and friends , took a long view, convincing the citizens to give up the strategic food bank would go a long way to defeating us. I take my own heliocentric findings very seriously, and give them a more suitable name so as to disassociate from the nonsense. And so, are we to honor Galileo as an astrologer? The look of that list of weather events sounds like alternating polar cold air masses and then a bulge of gulf air coming north (but dry, as though more Mexican desert source). The “loopy jet stream”… Knowing that, we could now plan better. So when it “goes loopy” frost tolerant crops could be grown instead. Like kale and cannola. (Both brassicas – cabbage family). There is also an interesting Indian desert corn that makes a ‘tap root’. Plant breeders are looking to move that into other faster field corns. Having a corn that is less drought damaged would be a very good thing. Similarly, in Texas you find some folks growing sorghum instead of corn. It is able to stop growing when dry, then start up again if it gets rain. Millet does that too. So if we know rains will be more sporadic, based on which side of the loopy jet stream is overhead, we can plant more sorghum and millet that can cope with that, and less corn. When a crop fails, a ‘catch crop’ was the traditional solution. Things like buckwheat that are more cold tolerant AND grow very fast. 40 days in some cases. Knowing that there will be more surprise frosts, farmers can stock more buckwheat seed for ‘catch crop’ use. So there’s things we can do. It is more a matter of getting folks to do them. It would be far better, if we know “crop failures” are more likely, to have farmers “stocking” an added batch or two of seeds on premises. IMHO, the savings from NOT having spoiled seeds in the heat of summer would likely pay for the cooler to store them. But that is not what we do these days. Now it’s all “just in time” production. From seed factory to grocery store. If “A Bad Year” happens, we are “in the toilette” until next year. In just months. We are one volcano away from a global famine. IMHO, that’s worth a Mason Jar in the fridge, a “toy garden” out back, and a small closet with some boxes of dried goods in it. Tidal forces affect maga and oceans (weather). The same planetary orbital resonance keeps the sun motion in sync with lunar tides, so trying to assign “causality” between solar changes (admittedly modest, but that UV…and clouds…) vs lunar ocean stirring is very hard. Too bad the Solar Princes can’t bear to name this one after the guy who successfully predicted it decades in advance. Maybe by the next one some sense of decency will evolve. Oh, and shall we rename Newton’s Laws while we are at it? He was an astrologer, after all. (The bitter pill here is that it’s turning out that the planets and their positions DO matter and DO foretell the future. Just in a more gross and physical way than what ‘modern’ astrology does – which is patently nutty – and more like the ancient astrologers did. “It will be a rainy period”; predicted by the Maya thousands of years ago and correct. Bang spot on! From the fall of the Egyptian Old Kingdom to the fall of Akaddia to the Hitties to the collapse of the Roman Empire. Collapses fall on periodic climate cold events. The weather shifts are the same pattern each time (as you describe, though sometimes more so) and it is cold and drought that kills. Though I don’t think this one will be that bad, as we are at the bottom of a lunar tidal stirring. But when at the top of those events, a solar min and we’re looking at 100 year droughts in Iran / Iraq / Egypt and rain driven crop losses with severely frozen in E. Europe / Russia while China gets both drought and frosts. 2) The “polar air masses” or “loopy jet stream”: Things get more variable and unseasonal frosts can happen. Again, can be dealt with, but only if thinking ahead. Historically, Millet was the staple grain of China and S.E. Asia to some extent. Why? More drought and frost hardy. So just shifting back to a more flexible grain can be enough. But will they? Don’t know. So it’s not so much about “where you are” as about “how fast you can adapt”. Yes, it is a waste. BUT, it also means we have a 44% over capacity of grain production available just by saying “No gasohol this year”. I’d rather have that extra grain growing than not. Exactly right, if long. Might also add the Monsanto move to patent and own seeds and sue anyone they can who saves their own seeds into oblivion. Oh, and buying up to put out of business traditional seedsmen. It is possible to grow food anywhere. It’s sudden surprise changes that are the problem. There are currently greenhouses using salt water to grow food in the Arab gulf states and in desert Australia. But it takes time to build one. Africa “greens” when things are hotter (pulls damp air inland and makes rains). We’re past that point. Cold is only 1/2 the issue, the other half is that things dry out. Droughts in the Levant and Egypt, for example. China too. There is one good bit. The Gulf Stream slows down and the heat it transports ‘backs up’ into Florida and The Gulf. That means more warmth and rains in Florida and the “Desert Southwest”. So there are some places that ‘pick up the slack’. Also Latin America has much lower impacts as more of it is water (so less drying possible and less freezing) and it is mostly closer to the equator. Though again, I’m pretty sure THIS event will be far less than a D.O. or Bond cycle event. Wrong lunar tidal force. Then again, if Katla blows off or Mammoth “Lakes” or Yellowstone decide to toss their cookies, we’re all toast anyway. Somewhere I’ve got a copy of a paper showing darned good match of solar cycle and cooling… one cycle AFTER the solar quiet starts. So maybe L. was just off on delay time on that mechanism for 1990. If he found the mechanism, but missed one cycle delay time, that is still a major things. Too bad the Solar Princes can’t bear to name this one after the guy who successfully predicted it decades in advance. Had this actually been the case, things would be very different, but, no, T.L. did not successfully predict anything decades in advance as my links to his ‘work’ show. Good point redneck, and that is why we post. I had relied on another party. With thanks. Thanks bacullen, its back in. The Ap index so far for the month of January, 2013 is 2. Quite remarkable. A big sleep is coming. Personally, I would not have been so ready to attribute hypocrisy to Galileo [having read most of his writings], but opinions differ. Do you think that is what caused him to be so venerated by the Enlightenment? Then you must have a full understanding of his work to make such a statement. Could you tell us the the main repeating data or occurrence that T.L. used to predict grand minima in 2030 and further. It is a simple question, so a straight simple answer would be appreciated. ‘Hypocrisy’ is too strong a word. In his time, astrology was an accepted practice and Galileo was often required to perform such service for his benefactors [because they believed in it]. Galileo was one of the founders of the Scientific Method [cause of his venerated status]. Then you must have a full understanding of his work to make such a statement. Could you tell us the the main repeating data or occurrence that T.L. used to predict grand minima in 2030 and further. The basic idea is that of solar ‘fingers and hands’. He says” “These five-fingered hands are an utter surprise. Scientists conceive that the sun is a body composed of dead matter. As such, the sun should not display five-fold symmetry – two-fold, threefold, four-fold, or six-fold symmetry like crystals, but not five-fold symmetry reserved for the realm of biology” and “The sun’s dynamical fingers point to the number five, a close relative of the golden section. The number five, represented by a pentagon, is closely connected with the golden section. When all corners of the pentagon are connected by diagonals, a five-pointed star emerges. The intersecting lines of this pentagram form a web of golden sections. Within this star emerges a smaller pentagon that contains a smaller star with golden section divisions, and so on, in an infinite fractal sequence”. The simple answer: “this is not science”. The basic idea is that of solar ‘fingers and hands’. Fail. There is a lot of esoteric crap (esp his earlier work) to sift thru that makes it easy for the likes of you to divert attention. But there is a recurring theme that is based on good numbers that can be isolated that is the core to his Grand Minima predictions. Most would not have a clue, which is understandable. Stephen; I don’t have it at my finger tips. I don’t see where it is in wiki though either. I am fairly certain I didn’t make the statement based on something I found there. I don’t think I looked at the wiki site before posting my comment (or even after) and I don’t see the assertion on the page about him this morning. Perhaps you are looking at a different page. If I am wrong in my assertion; I apologize, but I don’t think I am. I have little doubt that Landscheidt had crossed over the line from being a scientist to being an advocate. Perhaps a more common occurrence than most suspect. If one discovers that two pieces of a large and complex puzzle fit very neatly together, they can hardly be blamed for advocating their position. If I have spoken too harshly of him (in comparing him to the likes of Hansen, Jones and Mann), then so be it. Perhaps he was more conscientious in his science than that particular group. Mind you, I do still believe that he used the term ‘Landscheidt minimum’ several times though I can find no reference to it this morning. I will attempt to find that out, at least as long as my attention span allows. Either way; In my opinion, Jack Eddy never suffered from such certitude. He knew what he was trying to understand and knew that he didn’t understand it. As such, he embodied the epitome of scientific endeavor to me. His analogy to trying to understand ‘God’s giant patch cord in the sky’ put the puzzle into a kind of perspective for me that worked and indicated that, whatever current climate scientists think they understand, they don’t understand how that patch cord works. If they did their models would be a lot more skilful than they are. When I read that it had been decided to name the impending minimum after him, it did make me smile. I hope that at least that part of this story is correct. But there is a recurring theme that is based on good numbers that can be isolated that is the core to his Grand Minima predictions. Anybody [my then 5-yr old grandson did that a few years back] looking at http://sidc.be/html/wolfaml.html can see a nearly 100-yr cycle and extrapolate. T.L. had no idea what was going on. Earlier he ‘predicted’ the Grand Minimum to be in 1990. When that didn’t happen it was time to move the goalposts. Your reaction reminds me of a story about spoon-bender Uri Geller. When it was pointed out to somebody that Geller had been found cheating 70% of the time, the response was: ‘so what? in the remaining 30% of the cases, Geller really did bend the spoon by mind alone’. It seems to me that you fall in that same category. I edited the Wiki entry about 12 hours ago, so we will see if Connolley lets it through (he also has an issue with the man). The referenced paper for the alleged statement came up short and I have read most of his work and not seen the claim. It is a slur on a deadman that needs to be resolved, either way. In the talk on the page in 2008 Wiki is challenged to provide evidence of T.L’s statement re his name on the Minimum, no response was forthcoming. The bias of Connolley is clearly evident. In the meantime no assumptions should be made. It seems all you have is Ad Hom. It also seems that you have no credentials to criticize. With regard to your reponse below I wonder if his change of view was 18 years before the prediction was proved incorrect or some time afterwards when he’d had time to work out a modification to the original theory? They’ll pick back up again soon, it’s temporary. Lower cycles see more short term drop outs with low activity levels. I wonder if his change of view was 18 years before the prediction was proved incorrect or some time afterwards when he’d had time to work out a modification to the original theory? He saw the light around 2010 when it was clear that cycle 24 was not increasing as fast as he thought. This is how science works: when your prediction turns out wrong, you acknowledge that your reasons for making the prediction were not correct, and you admit it. Leif, it was you who attributed scepticism of astrology to Galileo, not I. The evidence you gave for this was: “having read most of his writings” which is hardly sufficient. Galileo did in his Dialogues ridicule those astrologers who made “predictions” in retrospect, but this is hardly a general scepticism. Had he been merely toeing the line, he would hardly have managed to get into trouble with the Inquisition in 1604 for forecasting the time of his clients’ deaths. This is well beyond the scope of medical astrology (which he was hired to teach) and well beyond what the church sanctioned because it contradicted the doctrine of free will. None of the contributors to Galileo’s Astrology edited by Nicholas Campion share your belief. Scepticism of astrology did arise in the 17thC, but in England, not Italy. Leif, it was you who attributed scepticism of astrology to Galileo, not I. So who does not know that clemency, kindness of heart, gentleness of manners, splendour of royal blood, nobleness in public functions, wide extent of influence and power over others, all of which have fixed their common abode and seat in your highness – who, I say, does not know that these qualities, according to the providence of God, from whom all good things do come, emanate from the most benign star of Jupiter? And yes, Galileo did stress the importance of empirical evidence. When questioned by Piero Dini on the astrological import of his discovery of Jupiter’s moons, he responded that he did not know in an 11 page letter written on 21 May 1611. It would not seem right to assert that “these Medician Planets lack all influence, wherein the other stars abound”. Galileo drew a comparison with different plant species which have their “qualities, virtues and effects” yet to be explored. On the other hand, scientists regularly dismiss Galileo’s empiricism. How many times have we heard the falsehood that Galileo dropped a wooden and an iron cannonball from the tower at Pisa and to the consternation of the Aristotelians they both arrived at the ground simultaneously? Galileo wrote that his assistant dropped the cannonballs from a height some 300 feet greater than the height of Pisa’s tower and that the iron ball arrived at the ground a considerable distance ahead of the iron ball. Many thanks for the information, I’ve taken on board what you say regarding admitting mistakes and incorrect theories, seems that Dr Hathaway is in the minority in the topics discussed here. It seems odd that you should object to an astrologer being characterised as an astrologer. You are on the wrong track. All the details that the Internet can serve up on Galileo are irrelevant. What matters is that T.L. used astrology as a basis for his ‘science’, and Galileo never did [to my knowledge]. If you can produce evidence that any of G’s findings were based on astrology, please let me know. With respect, I have read a paper where T.L. calculated the barycenter of the Sun and correlated that to climate parameters on the Earth. On that basis he predicted future climate behaviour. That is ‘science’ of the same kind as Newton’s ‘Principia Mathematica’ which indicated how bodies interact and but did not indicate the mechanism by which gravity operates. Whether or not T.L. is right can only be determined by the success or failure of his predictions. And if (n.b. IF) those predictions are right then his work indicates that the variations in the Sun’s barycenter affect solar behaviour to affect the Earth’s climate. However, if the predictions of L.T. are wrong then that indicates variations in the Sun’s barycenter do not affect solar behaviour to affect Earth’s climate. Hence, the work of T.L. can be dismissed by failure of his predictions but cannot rationally be dismissed by calling it “astrology”. Yet Leif Svalgaard can call anyone who disagrees with his views a pseudo-scientist and he does not get a moderator response. Why isn’t he asked to support his smears and aspersions with some specific evidence? We seem to have one rule for Leif and another for his opponents. This particular moderator response shows the double standards that are applied to posts at this site. Interesting how those that don’t understand resort to the “Astrology” meme instead of actually looking at the actual science that Landsche*dt did put forward. Imagine if Einstein had some wacky ideas published, one of them being E=mc2 that no one took notice of because he was already pigeon holed. This is an accurate analogy. For those that struggle or bother to read, Landsch*idt had a math’s based model that hindcast Grand Minima and predicted the future. But he had a problem, the model produced markers that occur usually EITHER side of a Grand Minimum. At present the mathematical model produces a marker at 1990 and 2030, hence his confusion (and those who are unread), but he had the bare bones of something special. Without this very important (not quite accurate) discovery we would be miles behind today. He was truly a pioneer who will be applauded by all in the not too distant future. I think with your friend, that it has been of late too much the mode to slight the learning of the ancients. Benjamin Franklin to William Brownrigg, November 7, 1773. I invite you to check this at your nearest academic history library. You are of course invited to peruse my own copy, but suspect that Tasmania is too far distant from where you are located. If you have any evidence that G was not an astrologer, or that he didn’t incorporate his findings into his astrology, this scholar would like to know. It would be a blockbuster in the field. Precisely. It falls well inside Popper’s testability criterion. With respect, I have read a paper where T.L. calculated the barycenter of the Sun and correlated that to climate parameters on the Earth. At this point we are also in the position to answer the question asked at the beginning: Why has the 11-year sunspot cycle just this length? We know that the stability of the planetary system hinges on the Golden section, which is intimately connected with five-fold symmetry that emerges in the Sun’s dynamics, which again is related to the Sun’s activity. Thus, it seems plausible to assume that main features of solar activity like sun-spot cycles are closely connected with the Golden section. This is so indeed. The real cycle of sunspot activity is the magnetic Hale cycle of 22.1 years. The Sun’s global magnetic field varies over this period, during which the field reverses and is restored to its original polarity. One such Hale cycle comprises two successive 11 -year cycles with opposite magnetic polarities. Thus, it becomes apparent that the length of the magnetic Hale cycle and of the 11-year sunspot cycle is connected with fivefold symmetry in the Sun’s oscillations about the invisible center of mass of the solar system and the constellations of Sun and planets that generate it. We could also say that the length of these important cycles of solar activity can be explained in astrological terms. Yet this aspect becomes accessible only when we follow Kepler, Galileo and Newton, who integrated astrological or alchemical imagination with methods and insights of modern science. Astrologers should acknowledge as well as scientists that we need a genuine interdisciplinary approach that combines the all-embracing astrological world-view with recent results in progressive science. Whether or not T.L. is right can only be determined by the success or failure of his predictions. If you have any evidence that G was not an astrologer, or that he didn’t incorporate his findings into his astrology, this scholar would like to know. You have this backwards. The question is whether he used his astrology [that the planets rule the fate and doings of humans] in his scientific work on motion, sunspots, heliocentric theory, etc. If you can show that, I would like to know, and that would be a true blockbuster. So make my day. Speaking just for myself, I could not credit such a statement as coming from a serious scientist. Global cooling leads to less rainfall, so arable land shrinks, food production shrinks. Neither can I, but some people have a much lower bar and will believe almost anything if it fits their agenda. Now, there is nothing wrong with being an advocate, but advocacy should not be touted as science or scholarship, and must be opposed when such masquerading occurs. It is you my friend who have this backward. G was employed, not as a Natural Philosopher (for that is what scientists were called in those days), but as a mathematicus. He taught mathematics, astronomy and astrology to medical students at Pisa and Padua before being appointed as mathematicus and philosopher (not natural philosopher) to the Medici court. G had a long and successful career antagonising as many natural philosophers as he could while coveting their appellation. Had he not been an amazingly successful astrologer it is somewhat doubtful we would ever have heard of him. That would have been a great loss to the world as his introduction of mathematics into physics certainly transformed the way we view the world. I have never claimed that G “used his astrology… in his scientific work on motion, sunspots, heliocentric theory…” and it is quite improper of you to imply that I have. My original statement was: “Never to forget that Galileo, a man much venerated in scientific circles, was a teacher of astrology for many years and rather famous for his astrological predictions that he claimed were absolutely certain.” And nowhere can I find any claim that he was ever employed as anything other than a mathematicus. I have never claimed that G “used his astrology… in his scientific work on motion, sunspots, heliocentric theory…” and it is quite improper of you to imply that I have. The difference between Galileo and T.L. is that the latter did claim to use astrology and numerology and mysticism in his ‘work’ on solar cycle [and many other cycles – economic, menstrual, etc]. That is the issue, whether Galileo was a famous astrologer is not the issue. I had no idea that TL made those claims; he certainly didn’t in the paper to which I believe Richard was referring. It appeared on John Daly’s website quite a few years ago and my recollection may be faulty. I just thought that the fact that he was an astrologer was as irrelevant to his science as Einstein’s being a patent clerk was to his, hence my original comment. Pace. In English – This means that we will backing our home-grown intellectual thug no matter how much he puts down anyone who dares to disagree with him. This is no different to Tomino over at Real Climate. This is why the real discussion of climate issues is now taking place on other blog sites. I have to agree, there does seem to be a bias in this forum. For reasons of openness, I provide the following explanation. No, that was not the paper to which I was referring, although I see it is very similar. I think L.T. probably was an astrologer, but I don’t know. Whether or not he was an astrologer is not relevant to whether his calculations are correct about the physical relationship between the solar barycentre and the Earth’s climate. The correctness – or otherwise – of that relationship alone is of importance. L.T. wanted to get a paper published in the peer reviewed literature which would report his calculations. And he asked me to help him with the wording of a paper he wanted to submit. I was surprised by the language in that paper because much of it was pure gobbledygook of the kind that Lief has quoted in this thread. Please note that I know little about solar effects so I was not – and I am not – competent to assess the validity of his work in that paper except in terms of assessing his calculations. My contribution was solely to alter the language he used to report that work so the paper could be submitted to journals for consideration. However, I am able to say that the paper did not contain astrology: it consisted of calculations and correlations which comprise a basic scientific study. I explained to him that use of such language as his draft paper contained would prevent publication of the paper. And I suggested many amendments to his text which he adopted. The amended text contained descriptions such as ‘fingers’ which were clear in context (a graph had five peaks which did resemble digits on a human hand) and in retrospect, perhaps, I should have suggested that he not use that phrase. However, my suggested severe amendments were many and I did not want to alter the language so much that the paper was no longer his. Eventually, the paper as amended was put to peer review then published in E&E. This was long before I was asked to join the Editorial Board of E&E. Thanks Richard. You where in a very privileged position. I understand your predicament , and also agree with your recommendations. But the underlying facts surface over time, the Landsche*t torque extrema is very close to revealing the true nature of what influences our Sun. …. If an enemy of the US and friends , took a long view, convincing the citizens to give up the strategic food bank would go a long way to defeating us. It is worse than that. Sec of Ag Earl Butz/Nixon/Kissinger sent the U.S. Strategic Gain Reserve to the USSR and then sold off government storage bins in 1973. Amstutz just continued the trend. America Gets the Shaft: Henry A. Kissinger led the ill-planned and uncoordinated foray into Soviet economic policy which resulted in disastrous consequences for U.S. markets and international prestige. …Beginning in 1973, policy changes promoted by Nixon Secretary of Agriculture Earl Butz deregulated the corn market. He dismantled supply management policies, selling off government storage bins used as food security reserves and implemented “fencerow to fencerow” planting. Butz believed any overproduction should then be dealt with thru exports and free trade.” The Russian Wheat Deal and the World Food Crisis of the early 1970s gave Butz the chance to promote the false notion that free markets would be good for farmers. Butz and agribusiness giant, Cargill, along with the Farm Bureau argued that farm prices crashing would be a positive because they would be remedied by more exports and new uses such as ethanol and corn sweeteners…. Interesting that corn to ethanol was making its appearance as early as 1973, one year after Maurice Strong was screaming about Global Warming at the First Earth Summit in 1972. Note how US temperatures at the time had taken a real plunge. That is OK, GISS is busy ironing the temperature record flat as shown. “Any link solar activity and plate tectonic activity? There is a link discovered by some very clever Japanese scientists. Japan has a special interest given that it has many volcanoes, with several currently active. The paper is entitled “Explosive volcanic eruptions triggered by cosmic rays: Volcano as a bubble chamber” Toshikazu Ebisuzaki, Hiroko Miyahara, Ryuho Kataoka, Tatsuhiko Sato, Yasuhiro Ishimine. It is published in English by Gondwana Research. If you look at great earthquakes, which by their size tend to occur on major fault lines between tectonic plates you will see that the incidence has increased by around a factor of 6 or 7 in the period since 2004 compared to the previous 50 or more years. I believe we can trust the records for the last 60 years but many earthquakes may not have been recorded earlier. The reason why I believe this is that the US was seismic monitoring for underground nuclear tests from the end of the 1950s. If tidal forces from Jupiter, Europa, Ganymede and Callisto make Io the most seismically active body in our solar system, you would have to consider that when the gas giants get roughly into alignment and Earth, moon and Venus also get more or less into that alignment (with the sun) then some of the additional (admit-ably relatively weak) tidal forces on Earth must slightly increase the local temperature of the mantle much in the same way that tidal forces increase the temperature of Io’s mantle. The other alternatives include the moon moving extra millimeters from Earth or the rotational rate of Earth speeding up a millisecond or two but surely this would be noticed. It may not be that much extra heat being produced in the area most affected by those tidal forces but I suspect that small increases in temperature would still very slightly increase the movement of the tectonic plates. Of course there could be delays of years or even decades from the effects of such slight changes before there is extra volcanic or major earthquake activity. 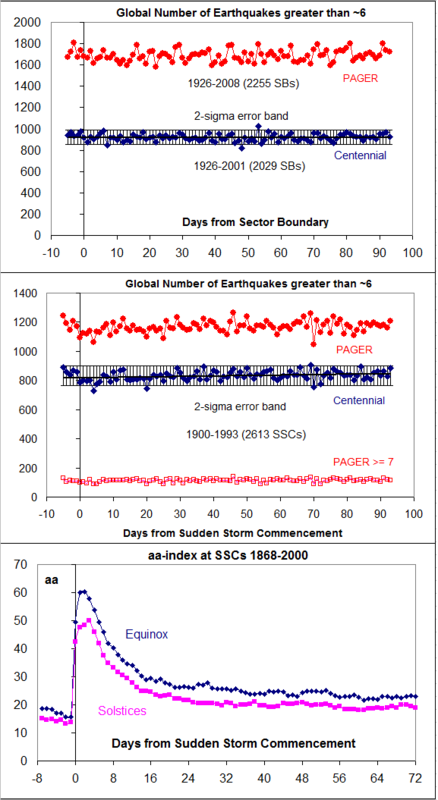 Even then the solar system induced changes in seismic activity more effects the timing of such activity simply by bring forward events by years or decades that would have eventually happened anyway. Unfortunately there aren’t good enough earthquake records across Earth prior to the late 1950’s so it is impossible to test any theory. But when you look at when many of the great cities of the world were destroyed by great earthquakes it does seem that quite a few of those earthquakes occurred during grand minimums. (Dubrovnik and some of the great byzantine cities in Turkey for example) This would be an interesting research project for someone. So to turn to the original thread of this blog, I believe that there is an increased risk of a major volcanic event, or two, occurring during a grand minimum so it would be sensible for the world to increase grain stocks rather than let them run down. This is a far more immediate threat than any consequences of man possibly causing climate change. do you have any evidence in support of this claim?